Choosing lenses and focal lengths for landscape photography has a lot of layers, and it’s a topic I wish I researched more before jumping in. Accordingly, below is detailed information on ideal focal lengths for landscapes with example photographs and our take on each. We’ve also picked and described the top wide-angle lenses for both crop sensor and full-frame cameras from Canon, Nikon, and Sony. The truth is that there isn’t one correct focal length for landscapes, but it’s well worth investigating before making a big purchase. The majority of landscape photos are of the wide-angle variety, which dictates the lenses and focal lengths that we discuss below. There isn’t, however, a universal definition of wide angle (Wikipedia, for example, offers the not-so-helpful, “a lens whose focal length is substantially smaller than the focal length of a normal lens”). It’s generally accepted that the human eye sees at a 50mm equivalent, so anything less than that technically is wide angle. For landscape purposes, we think of the wide-angle focal length range as 14mm to 35mm on a 35mm camera. Anything less is getting into fisheye territory, and anything more is pretty normal and doesn’t have a wide-angle feel. The heart of the wide-angle zone for landscape professionals is more like 14mm to 24mm, but we will address 27mm focal lengths and narrower because that’s where many popular APS-C lenses start. This means that a Nikon 18-200mm lens is equivalent to 27-350mm on a 35mm camera, which has much less landscape usefulness than if it were 18mm at the wide end, for example. The same goes for Canon: the popular 10-18mm wide-angle lens for APS-C cameras is equivalent to 16-28.8mm. The good news is that this focal length range is terrific for landscape photography and actually much better than 10-18mm on a 35mm camera. We would love to survey crop sensor camera users about focal length equivalent, and would bet that a significant percentage do not understand the concept. Years ago, the first real lens I purchased was the Nikon 18-200mm—I had read about landscape photography and thought that I was getting a true 18mm at the wide end. Nobody in the camera store told me about crop factor and it wasn’t until I started shooting that it all came together and I learned my lesson. This means that the 18-55mm kit lenses that come standard with Nikon and Canon DSLRs actually are 27mm and 28.8mm at the wide end and not as useful for landscapes as many people assume. In addition, these lenses often aren’t at their best optically at 27mm or 28.8mm (more on this below), so serious landscape photographers will want to add a specific wide-angle zoom or prime lens. Those buying a point-and-shoot camera for landscape photography also should keep an eye on focal length equivalent to make sure their camera can go wide enough. This photo was taken with a Nikon 14mm f/2.8 prime lens on a full-frame camera. 14mm is at the ultra-wide end of the landscape spectrum and you need a number of things in your favor to pull it off. 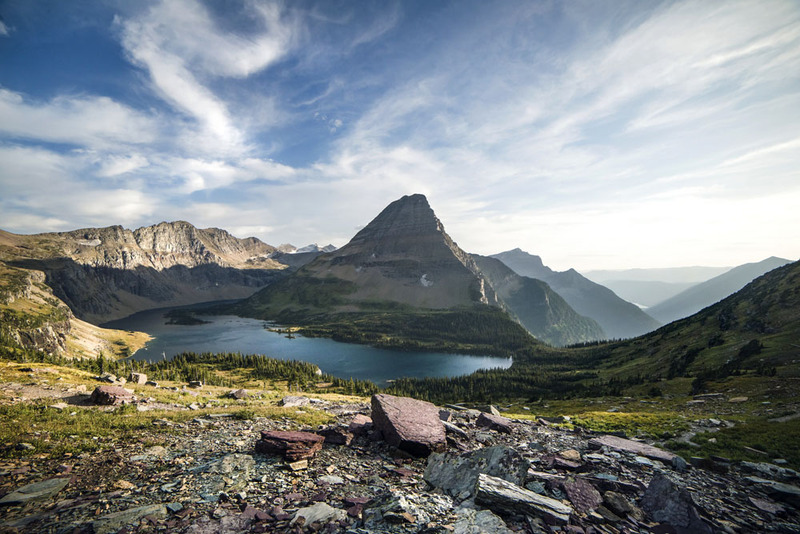 First, this is a massive scene: Glacier National Park in Montana and one of the most magnificent and wide-open places in the Lower 48. This photo has tons of sky and covers a huge area side to side. Second, the photographer made excellent use of foreground, which is essential when shooting ultra wide. Finally, it’s a high-end prime lens and camera (together the camera and lens combo was close to $5,000), which helps in making the image look excellent overall. All of the concerns above don’t mean that you shouldn’t buy a lens that shoots at 14mm, but just know it will have a high degree of difficulty. If you don’t use foreground, the viewer will have nothing to visually grab on to and the image loses its feel. 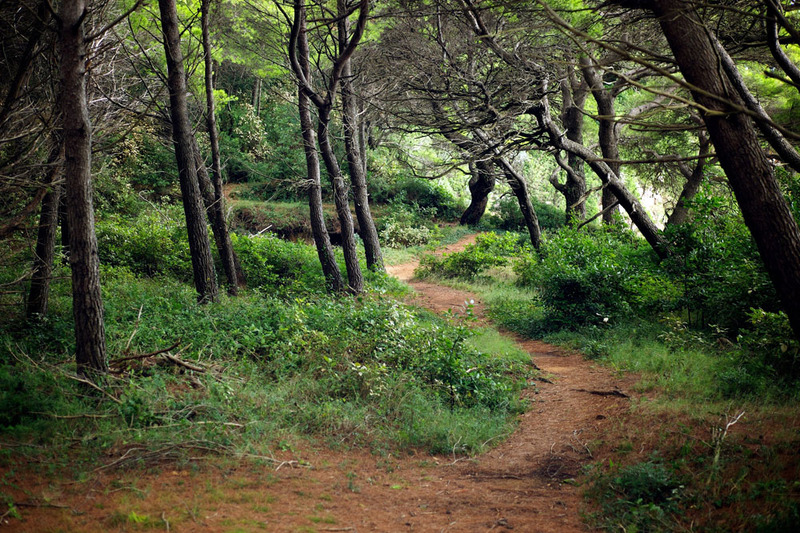 If the landscape isn’t large and dramatic enough, the photo can look too wide and unappealing. If you're in area that has a lot going on, then it can be a challenge to simplify your scene and not overwhelm the viewer's eye with where to look. And if your gear isn’t good enough, you’ll have softness, falloff, distortion, and all of the other things that can make an image look bad. You’ll be hard-pressed to find APS-C cameras at the 14mm focal length in the first place, which probably is a good thing. 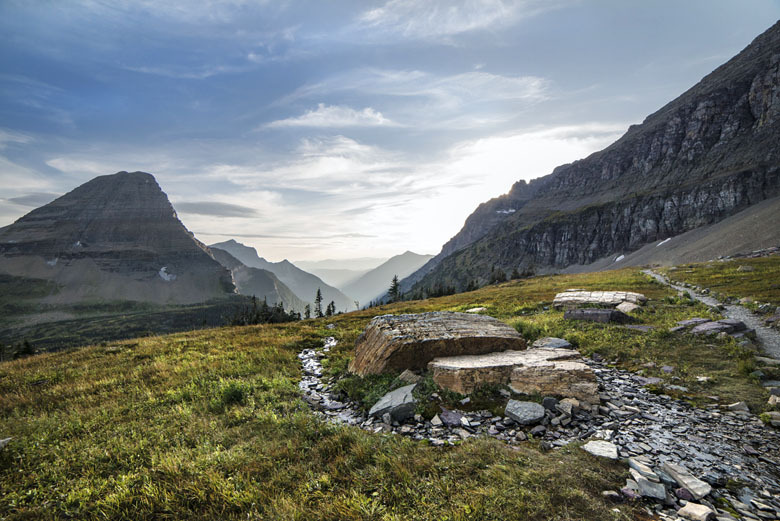 This shot was taken with the Nikon 16-35mm f/4 VR at 18mm, and also in Glacier National Park. 18mm is where things start to open up and you won’t feel as much pressure to frame everything perfectly. You can see this image still has excellent use of foreground and strong composition overall, but it doesn’t feel quite as big as the 14mm above. Shooting at 18mm gives you more versatility in terms of the scenes that you can capture. As we discuss below, zoom lenses often don’t perform best at their widest with more distortion and softness. Even bumping the zoom in a couple of millimeters from 16mm to 18mm can make a notable difference in image quality. All in all, 18mm is one of the most useful focal lengths for landscapes—right up there with 21mm below. We’ve arrived at our personal favorite focal length for landscapes: 21mm. Yes, there are great uses for going wider or narrower, but if we had one prime lens to choose for landscapes, it would be 21mm. With this focal length you still get the wide-open feel that starts to evade the narrower focal lengths below, but it’s not too wide for many situations. There are a number of fun 21mm lens options and it’s often at the heart of the range of many wide-angle zooms. I captured the photo above in Norway with the Zeiss 21mm f/2.8. It’s an incredible lens that has manual focus and is quite heavy, but you can’t beat the optics. It has almost no distortion, very little falloff, and is sharp corner to corner. The lenses above are considered to be “ultra wide”—again a rather arbitrary definition—and 24mm is where things start to normalize. You may notice when scrolling through photos in magazines or on flickr that 24mm is where many of the images start to shift from landscapes to urban and people shots. Again, this isn’t a hard-and-fast rule and you can take spectacular landscape photographs at 24mm, but you’re no longer ultra wide and may start losing the scale and grandeur of some large scenes. Images tend to flatten out the more you zoom in. The volume of landscape shots taken at 24mm goes up in part because of the popular 24-70mm f/2.8 lenses for Sony, Canon, and Nikon full-frame cameras. These pro zooms are some of the most versatile lenses on the market and great for everything from the outdoors to people photos. Some primes are available at 24mm but the selection is more scarce than at 18mm or 21mm. 27mm isn’t a heavily discussed focal length and you won’t find any primes at this 35mm equivalent. However, it is the widest focal length for the most commonly used lenses on the planet: the 18-55mm kit lenses that come with consumer crop sensor DSLRs (technically it’s 27mm for Nikon DSLRs and 28.8mm for Canon). It’s also found on all-in-one lenses like the 18-200mm and 18-300mm and a number of mid-range zooms like the 18-105mm. The bottom line is that for a lot of people, a 27mm/28.8mm equivalent is the widest they can go without buying a specialty wide-angle lens. We took an entire six-week trip through New Zealand with the Nikon 18-200mm and definitely saw shortcomings when shooting landscapes. The photo above is shot at a 27mm equivalent, and you can see the complex distortion at the top of the photo and lack of foreground. It’s just tough to get everything in at this focal length when shooting big scenes, not to mention you’re battling distortion and softness from the lens itself. 27mm is okay for landscapes if that’s your only option, but we heartily recommend going wider. 35mm to 50mm can be used for landscapes, and particularly if the scene is further away and you don't incorporate foreground. For example, let's say you are standing on a ridge and shooting a mountain range in the distance: shooting at this narrower focal length is better than at 21mm where you are trying to get everything into the scene. Another example would be a detail shot like a forest or rock formation where you are trying to highlight certain objects. For these types of photos, it's not as much the grand landscape you are trying to capture, but a certain object or series of objects as part of a great landscape. To add some variety to your images, try using a large aperture like f/1.8 to capture shallow depth of field. Move close to some vegetation and stick it right in front of the lens while focusing on the subject in the background to create a "dreamy" effect. This also works well if you're looking to shoot handheld as you don't need to worry as much about bumping down the shutter speed to compensate for smaller apertures. If you’re asking whether you can shoot landscapes with a telephoto lens, the answer is yes. In fact, just about every type of serious photographer should carry a 70-200mm or similar lens in their bag. One type of landscape scene in particular beckons a telephoto lens: mountains. 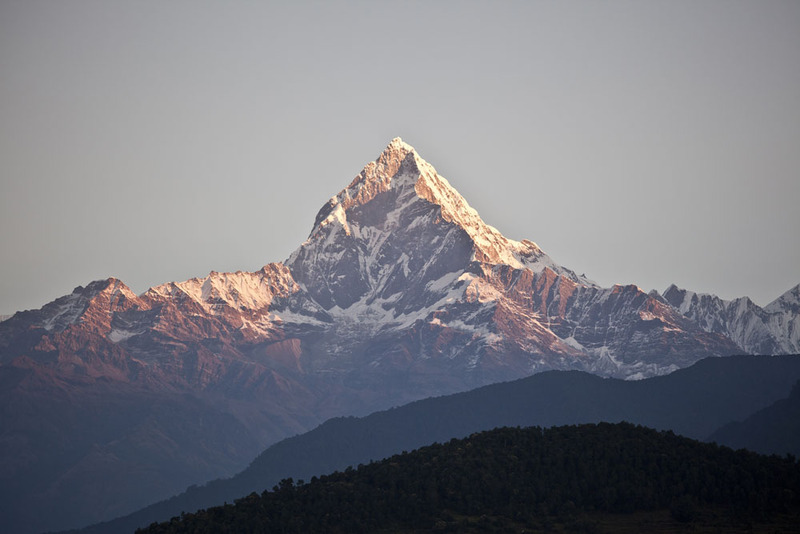 The shot above is of Machapuchare in Nepal at a whopping 169mm. Yes, the Himilaya are the tallest mountains in the world and I was far away when I shot this early morning photo, but you can’t capture the detail of mountains without extended reach. One thing to take into consideration when shooting telephoto landscape images is haze. 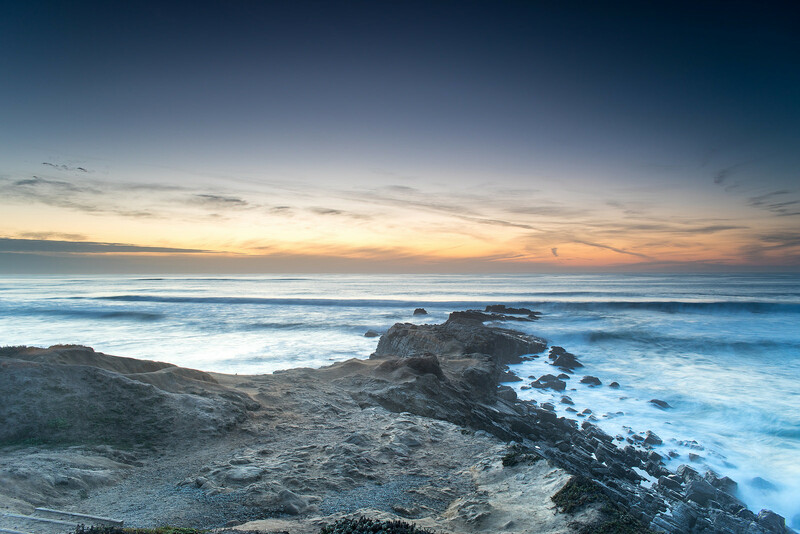 If there are a lot of particles in the air, try using a polarizer or that oh-so-handy "Dehaze" slider in Lightroom to cut through and get a clearer photo. Sometimes haze is simply unavoidable, and you either have to work with it or move back into wider focal lengths to focus on a subject closer to you. For APS-C shooters who have a Rebel series or enthusiast DSLR like the 80D, we love the Canon 10-18mm f/4.5-5.6 STM (equivalent to 16-28.8mm). Canon introduced this lens a few years ago as a cheaper alternative to the 10-22mm f/3.5-4.5 (equivalent to 16-35.2mm), which is more than double the cost. We love the low price of the 10-18mm, and the lens is sharp for stills and good for video with an STM focusing motor. If you’re serious about landscape photography with your APS-C camera and don’t mind the high price, the 10-22mm f/3.5-4.5 is superior optically. But for most photographers including those just honing their landscape skills, we recommend the 10-18mm. Full-frame Canon shooters have far more landscape lens options, and we love the versatility and value of the Canon 16-35mm f/4 L. This lens covers a great range of wide-angle focal lengths, has image stabilization for low light, and boasts the “L Series” build quality that photographers love. 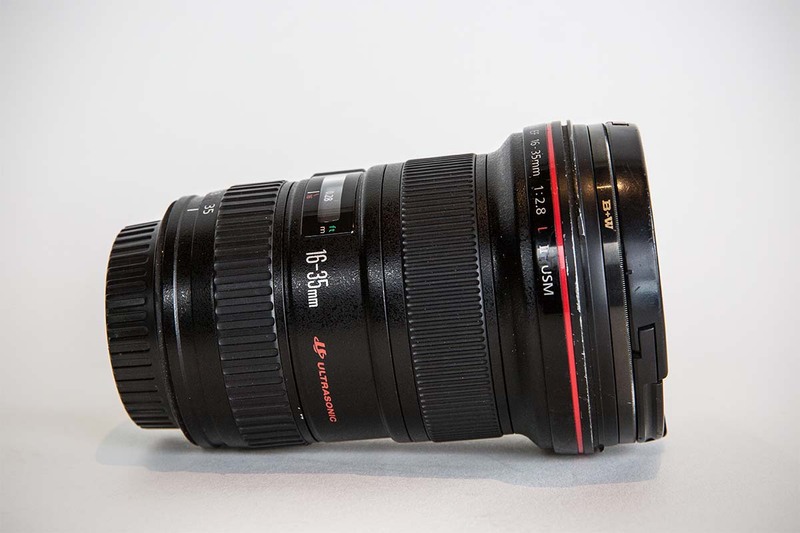 A more expensive lens at the same focal length range is the Canon 16-35mm f/2.8 L II, which is a true pro-level wide-angle zoom and a full stop faster. And for those looking to go a bit wider while avoiding hefty price tag of Canon's 11-24mm f/4, we'd recommend checking out Sigma's 12-24mm f/4 with the EF mount. A fun prime lens for purists is the Zeiss 21mm f/2.8 Milvus. This manual focus lens is heavy and expensive but can’t be topped at its focal length for image quality. Perhaps I have a personal bias—the old Distagon version is my favorite lens that I’ve ever owned—and not everyone will appreciate the manual focus. But it’s a high quality option for landscape photographers who shoot at 21mm. Finally, Nikon released an affordable DX landscape lens that made upgrading from a kit lens far more realistic for most shooters. The Nikon 10-20mm f/4.5-5.6 VR replaced the need to buy third-party lenses or expensive FX options. It costs around $300, has tested well in sharpness, and weighs a mere 8.2 ounces, making it a great wide-angle option for crop-sensor cameras. One downside is that the lens is so lightweight (hence made with a lot of plastic) that there are durability concerns, but it is cheaper to buy three of these than one of the full-frame equivalents. An interesting alternative to Nikon native lenses is the Tokina 11-16mm f/2.8 DX II (16.5-24mm equivalent). With this third-party lens you get less range and inferior build quality but superior low light performance. This lens also has notable distortion at the wide end, making Nikon’s built-in distortion correction mode almost mandatory. Things get fun for full-frame, and our favorite FX landscape lens is the Nikon 14-24mm f/2.8. All in all, it’s an extremely sharp wide-angle zoom that can even outperform many primes at their respective focal lengths. It’s also super heavy and expensive, which leads to our value pick: the Nikon 18-35mm f/3.5-4.5. A few years ago Nikon replaced the clunky 17-35mm f/3.5-4.5 with this lens and hit a home run. For a relatively inexpensive $750 you get a solid spread of wide-angle focal lengths to play with and great optical performance for the price. This lens does not, however, have vibration reduction, so hand held photos in low light can be challenging. Sony mirrorless cameras are ubiquitous in the outdoors, from casual photographers to industry professionals. For APS-C mirrorless cameras like the popular Alpha a6500, lens options are limited and the runaway leader is the pricey Sony 10-18mm f/4 OSS (15-27mm equivalent). $850 is a lot to spend for an f/4 crop-sensor lens, but the optics are strong including excellent sharpness. A considerably cheaper option is the Sony 16mm f/2.8 (equivalent to 24mm), which is compact and inexpensive but not as versatile or as good optically as the Sony 10-18mm. For Sony full-frame mirrorless cameras like the a7R III, a favorite among landscape professionals, the lineup continues to grow. The Sony 16-35mm f/2.8 GM offers spectacular optics, but we've had good luck with Sony's 16-35mm f/4 version as well. The latter is lighter and considerably cheaper, plus it shoots better sun stars, at the sacrifice of low-light performance. For those looking to go a bit wider, the 12-24mm f/4 is the widest zoom that Sony offers. Although you will save weight compared to the 16-35mm, we don't think it's worth it. The optics of the 12-24mm aren't as good and you have the unfortunate downside of it being a bulbous lens (more on that below), which eliminates the ability to attach filters. Zeiss has long been associated with superior build quality and optics, and they have some interesting options for wide-angle prime lenses with the Sony FE mount. One in particular that we like is the incredibly sharp Zeiss Batis 18mm f/2.8. When paired with the a7R III, it's bound to deliver some serious results. Not everyone will love being restricted by a prime, but if you're looking for simplicity in a wide focal length, give this lens a look. Just about every photographer seems to favor one or the other. Zoom lenses are more versatile and cover a range of focal lengths, while primes have a fixed focal length but superior optics including less distortion and better low light performance. In the landscape category, we prefer zoom lenses of the 16-35mm variety. As discussed in the focal length breakdown above, different landscape scenarios require different focal lengths, and a zoom gives you that versatility. 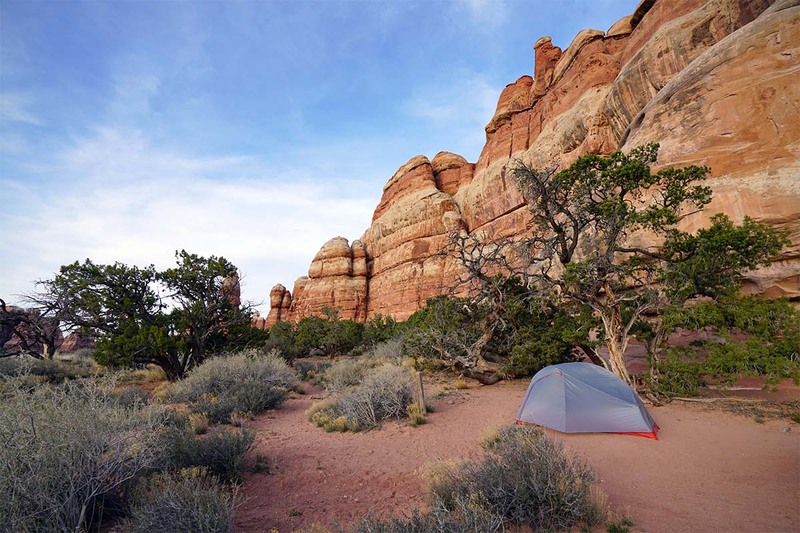 In addition, most landscape photographers tend to find themselves hiking long distances to get specific compositions, so saving weight is a concern. Therefore, we recommend carrying one zoom vs. multiple primes to keep weight in your pack down. But if you're someone who appreciates the challenge of being confined by one focal length, the lightest way to go is with a single prime. The reality of wide-angle zoom lenses is that they don’t perform best at the ends of their focal length range. It isn’t necessarily a massive drop-off, but you may notice more distortion and softness than you will more toward the middle of the zoom range. In fact, these lenses will perform quite a bit better if you bump them up even a couple of millimeters. For example, a 16-35mm lens likely will be sharper and have less distortion at 18mm, so take this into account when choosing focal lengths. This calculus also impacts the dreaded 27mm focal length (the common 18mm lens on crop sensor cameras). With these lenses, not only are you cutting it close in terms of wide-angle capability, but they won’t perform at their best at the widest focal length. This is even more reason why it’s worth looking for a specific landscape lens at your desired focal lengths. 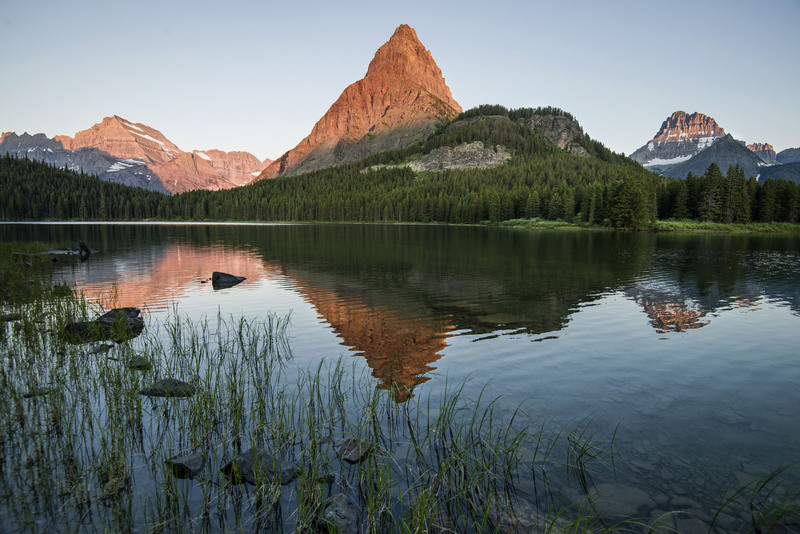 Tripods are a staple in the landscape photography world. Capturing an entire scene in focus usually means shooting with smaller apertures of f/10 to f/16, leading to slower shutter speeds. That range is the common sweet spot for most lenses, meaning shooting within those f-stops is where lenses perform their best and are the sharpest corner to corner. The good news: this means you don't necessarily have to buy lenses with larger apertures like f/2.8 and lower. These high-end lenses generally are more expensive and heavier than comparable models that are of f/4 or higher, and you typically can save a lot of money and weight in the process. You may need to carry a tripod and will be sacrificing low-light capabilities, and this does not apply to those interested in astrophotography. But if you're shooting between sunrise and sunset and interested in landscapes with a large depth of field, then save your back and wallet and go with the f/4 versions. If you have ever owned a bulbous lens like the Nikon 14-24mm f/2.8, you know exactly where we're coming from and how they can be a headache. For those who haven't, a bulbous lens has a glass element on the front of the lens that protrudes out past the lens housing. This can lead to problems with protecting the glass-it's far more exposed compared to a lens with flat glass. In addition, bulbous lenses are unable to take filters in the standard way other lenses do, making it difficult to use polarizers, neutral density filters, etc. You can buy third-party adapters, but the polarizing filters tend not to work in the same way, plus neutral densities add vignetting to your image. 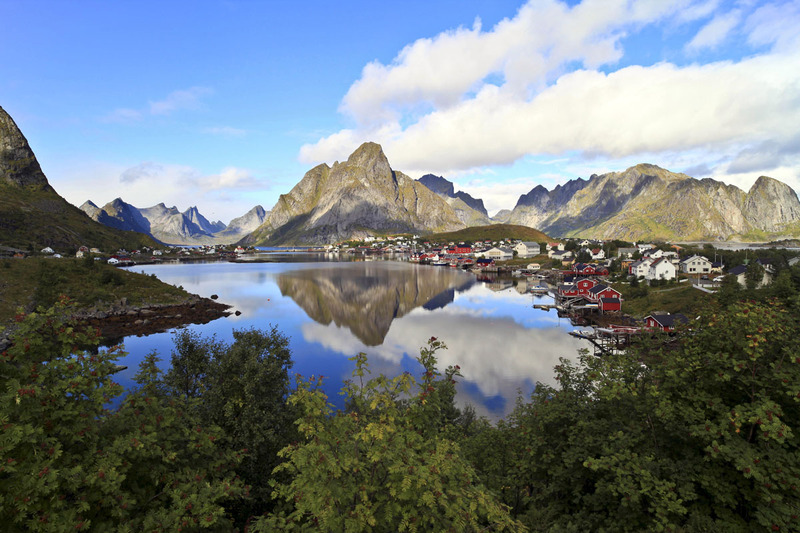 Despite the difficulties, many high-end, ultra-wide lenses used for landscapes are bulbous. If you're using one of these lenses, you're probably already aware of these issues and are shooting in good light. This eliminates the need for a polarizer and you can mitigate the need for a neutral density filter by exposure bracketing and blending those exposures together later in post. If this all sounds like a foreign language to you, then we'd recommending avoiding bulbous lenses and going with a lens that is 16mm at the widest. What About a Camera for Landscapes? For landscape photography you have the full spectrum of digital cameras to choose from, from compact point-and-shoots to mirrorless cameras and digital SLRs. To help in the process, we’ve created a handy guide to choosing a camera for landscapes, and you can see our full landing page of digital camera reviews here. Whichever route you decide to go, make sure to keep an eye on the focal lengths and lens scenarios discussed above.